Oh Sydney – your harbour and your beaches are devastatingly beautiful, your weather is so kind and you are as multicultural as ever. But there is one thing: your city centre is a bit of a hole. And it isn’t just me saying so. Your council knows it too because it has injected millions into reviving laneways and public art. Yes! Sydney has laneways too. Thanks to new licensing laws and government grants, small bars, cafes and shops are emerging everywhere and who doesn’t like to discover something hidden? Last weekend, I hit the CBD for some lane-ploration. I start at York Lane (near Wynyard station) and order a coffee at York Lane Bar – a cafe-by-day/bar-at-night situation. It’s of course, hidden in a laneway, past some garbage bins and cark park exits. Inside, it’s decked out with milk crates and wooden stools. There is a vintage bike hanging from the roof, as well as a disco ball and upside down salad bowls are the lights. The coffee is great and the staff is super nice. Fully caffeinated, I head to Angel Place for some public art. 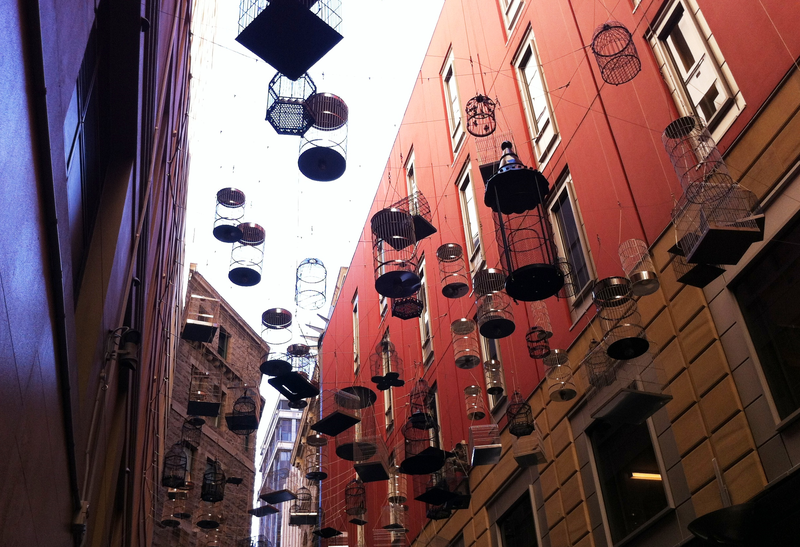 Angel Place has hanging birdcages with accompanying recordings of bird species that used to sing in Central Sydney before settlement forced them away. The adjoining Ash Street has a Euro-style bistro, Ash Street Cellar and Wine Bar (they aren’t that creative with names). With their wicker basket chairs out front, it all looks rather Parisian and fancy. After the lane-ploration, I head to Central Station to meet my friend. On my way, I see that the monorail has shut down and all the ugly infrastructure will go too. I hear that trams will be placed along George Street too. Good on you, Sydney. I’m sure you’ll be even more beautiful when I visit next time.